The death of Lewis Henderson. | Scuffalong: Genealogy. The death of Lewis Henderson. – Scuffalong: Genealogy. The death of Lewis Henderson. My grandmother, who was born in 1910, said her great-grandfather Lewis Henderson died when she was very small. She did not remember him, though her sister Mamie had reason to. He threw a brush at her — it hit her in the head — because she was making too much noise. She could not have been older than four. 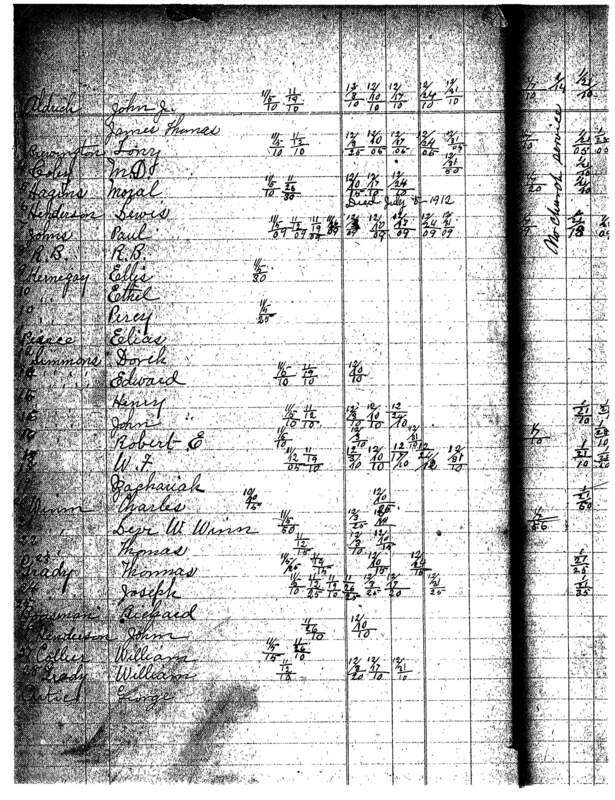 North Carolina did not keep death certificates until 1914, and Lewis’ grave is unmarked. How do we know exactly when he died? This is a page from one of the few volumes of early church records that survive for the Congregational Church of Dudley. Lewis had helped found the church in 1870, and this list shows tithes paid by male congregants. The sixth name: Henderson, Lewis. And this notation: “Died July 5 — 1912.” He would have been about 76. → Witnesses to a homicide. Pingback: Early going. | Scuffalong: Genealogy.